For what purpose you are used pro*c in your project. What is a package, advantages and disadvantages of packages? What is a procedure and function. Display the duplicate records in table. What is meant by overloading. What is meant by one time procedure. What is meant by function purity levels. What is meant by for update clause. What is meant by dynamic sql. 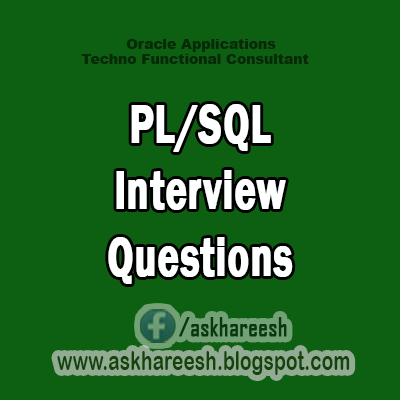 What are the types of exceptions in pl/sql. What is meant by raise_application_error. What is meant by utl_File. What are the exceptions are there in utl_file. What is the structure of varchar. What is the structure of sqlca. What is meant by whenever statement. How to embeded the pl/sql block in proc. How can you declare the cursor in proc. What is meant by ps command in unix. How to search the pattern. How to search a file in particular directory. What is meant by normalization. How many types of triggers can be created on a table . File uploading and generation in pro*c in detail with code. How do you compile pro*c program. What is table mutating? When do you get it? What is the use of cursor? What are different types of cursors? In a procedure I have written dml statement with in the loop and issued commit with in the loop. What will happen?